I admittedly wear a pair of gimlet eyeglasses when I talk about my experience with Jewish delis in that the ones I see through them are a limited selection of places I have tried in my life in the Southern California zone. I am sure Jewish deli purists could point me to the real veteran joints in places like New York City but for now I am merely talking from my myopic experiences in the land I know. My history is small and mainly consists of a youth spent eating in the open dining room of Sherman’s in Palm Springs. In a town where restaurants turn around faster than real estate deals it’s been one of the only places I grew up with that maintained its roots. Although it served the normal obscenely huge sandwiches loaded with meats and slabs of tongue with pickles on cold white plates, I usually opted for the desert-centric and Sherman’s-created Oasis salad, which was a beautiful thing with avocado, bleu cheese dressing and moist, chewy dates. Later on in the desert, a trendy Jewish deli cropped up called Manhattan in the Desert where I would eat nothing but their cream cheese blintzes in a special strawberry sauce while sipping mimosas on Sunday mornings. And when I would come to Los Angeles and venture out to Langer’s or Canter’s for a business meeting, it would always consist of chicken noodle soup and a trip to the pastry counter for rugelach before heading into their old school decorated bathrooms to take strange photo shoots of my friends or my feet on the classic retro tile. In all of those times, I never had a piece of meat or slice of rye and strangely so because those are two of my favorite things – although I have a feeling it had something to do with a half sandwich being the size of a small horse’s head. This past year I met my first proper Jewish deli experience at Brent’s in Northridge. It was one of those cold Christmas holiday days where you have already eaten so much food and fallen off your normal health track that you just keep going until all the relatives leave. We arrived at Brent’s and the parking lot was already filing up before noon with patrons spilling out of the front doors. Upon entering, I immediately knew it was all the best things I love in a Jewish deli: dessert cases floating with insanely large macaroons and marbled breads, lots of chattering patrons eating belly-warming dishes, bowls of matzoh ball soup with matzoh balls the size of dodge balls and really long chunks of tender shredded chicken, milky plastic tumblers with crushed ice to jam up straws and sip out through the lips, tangy dill pickles, greasy tablecloths hiding even worse things underneath, and all in a dining room jammed with low tables smelling and decorated like a family living room. But the best part was the pastrami sandwich, more manageable than I have seen at other places in size but still hefty with thin perfect, peppery slices of burgundy and pink meat. On a nice soft rye with some grainy mustard, the taste stayed in my mouth for days making me accustomed to a new kind of craving. 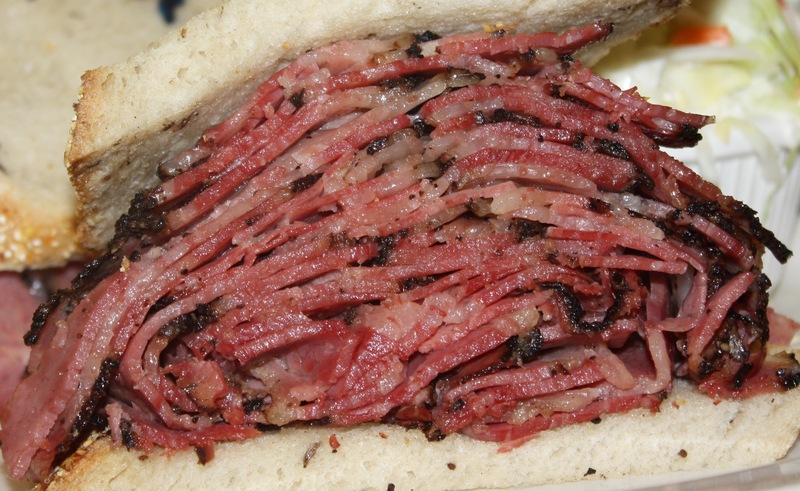 I think it’s the best pastrami I have ever tasted – perfectly verging on a thin line between wet and dry and cut in a way that formed a delicate and flaky pile that didn’t compete with its soft doughy bed. 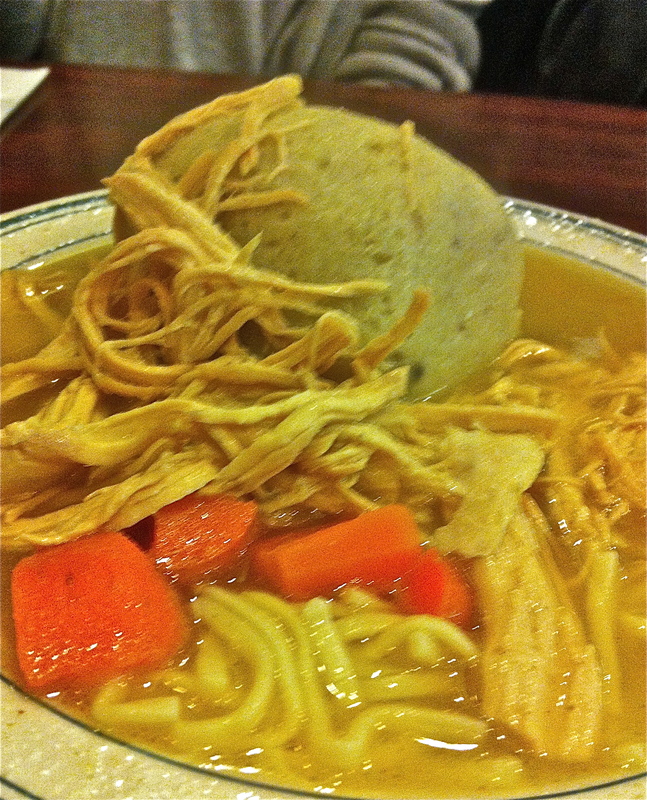 This entry was posted in Eating Out and tagged brent's deli, canters deli, jewish delis los angeles, Kimberly Nichols, langers deli, matzoh ball soup, nothridge delis, pastrami sandwiches, sherman's deli, Unorthodox Foodie by unorthodoxfoodie. Bookmark the permalink.